Posted by Christine Armishaw on 22/01/2019. Stephanie Dore is an equestrian vaulter. 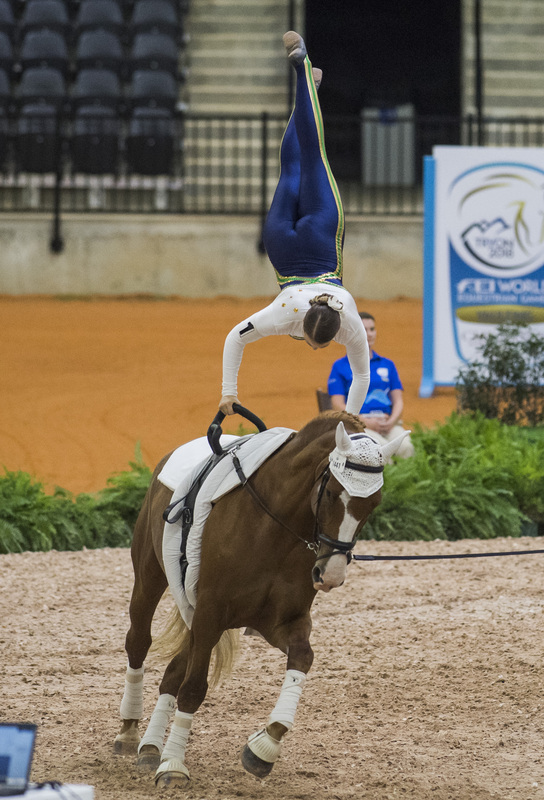 She has dedicated a huge portion of her life to her sport, and last year she was proudly one of six vaulters who represented Australia at the 2018 World Equestrian Games (WEG) in Tryon, USA. Steph competed in the Women's Individual Division. Performing in her beautiful, yet empowering Amelia Earhart inspired costume, she came 21st overall - the best ranked out of our Aussie girls entered in that division. This humble 23-year-old is no stranger to hard work and commitment. It would seem she practically eats, sleeps and breaths vaulting. In the lead-up to WEG, she was training with her coach not just every day, but twice daily. Everything including her diet, daily activities, and thoughts revolved around one thing - vaulting. I caught up with Steph to get the background on what it really takes to make it to an international level event, on a worldwide scale. Her answers are both surprising and inspiring. In a classic 'chicken or egg' scenario, Steph tells how she actually got into vaulting first, before horse riding itself. It's an amazing level of dedication that this athlete has - for Steph, the art of gymnastics on horses is not a hobby, but a lifestyle. Q. Tell me about younger you: How old were you when you first got into horses and did you come from a horsey family? "I definitely didn’t come from a horsey family, although my Dad grew up on a cattle farm that had stock horses, and my uncle had a few amateur race rides. My grandfather was also a very good horseman." Q. What other disciplines were you into or good at, and how did you first encounter vaulting? "I grew up in the suburbs of Melbourne doing gymnastics and playing netball and basketball. It wasn’t until I was in Year 7 at the age of 13, when my mum heard on the radio an ad for vaulting, gymnastics on horses. I went along as I had always wanted to ride horses and was previously a gymnast. After my first session I was hooked! After I started vaulting, I then got involved in horse riding. I attended pony club and completed a couple of shows. I then took a year or so off vaulting while I completed secondary school and free leased a horse to continue pony club and competed in a few eventing shows and combined training days. Now I only ride the horse I currently vault on to maintain his fitness." Q. Have you previously competed overseas before WEG – if so, where and when? "In 2014 I took a gap year after completing year 12. Within this year I began to compete in intermediate and went on to qualify for the CVI2* and CVI3* divisions. I had three months travelling around America, Canada and Europe attending training camps and competed in my first overseas competition. I also was very fortunate to be groom for US Junior Team in Aachen and watch 2014 WEG in Normandy. It was here that I decided I would love to make it my goal to compete at WEG. In preparation for 2018 WEG we mapped out a program that included two 3-month stints mainly in the US in March – May periods. This was to both gain competitive international experience and attain qualifying scores. Post selection for 2018 WEG I also spent seven weeks in the US & Canada competing and preparing on my WEG horse." Q. Tell me about the life of a Vaulter – what do you do daily or weekly as a routine to stay fit, strong, supple, healthy and continually improving your craft? "Leading up to WEG, my week would involve a minimum of three yoga sessions, two personal training sessions focusing on strength, three horse sessions, barrel and stretching sessions every day, meditation, visualisation and vaulting specific drills scattered throughout the week. I also worked with my coach, who is also trained as a health coach, to develop an eating plan that would best suit my body’s needs." Q. How do you go about finding the perfect vaulting horse, what makes it perfect and how easy are they to come by? "What makes a great vaulting horse is its temperament, balance, consistency and the bond that is formed between lunger, horse and vaulter. In Australia, I am very grateful to others for providing me access to their horses. Since mid-2017 I have been very fortunate in teaming up with the Kennett Family, who have the incredible horse Donati 3 (aka Don). That said, a big part of competing internationally is being able to adapt to different horses who all have unique characteristics." Q. What other team members make it possible for someone in your situation make it to the likes of WEG? "There was a huge amount of people that helped me get to WEG. I had my parents right behind me the whole way, assisting me financially, mentally and emotionally, and any other way they could. The first six months of 2017 I worked with Quicksilver team in South Australia, before relocating my studies to Sydney. The amazing Kennett family put me up on their property so I could further my training. Living with them gave me access to an amazing training partner Ginger Kennett. We would vault, condition, barrel train and coach one another. Georgie Kennett would lunge for both of us, and was an integral part of me receiving qualification scores for WEG. Of course, we can’t forget the amazing Donati 3, who I trained on while at home, leading up to the games and received qualifying scores on. My strength and condition coach Rob Marks was instrumental in tailoring a program for me so that I was peaking with strength come WEG. There are also my vaulting families overseas, that helped me prepare in the years leading up to and of WEG. Sharing their horses, training and time with me. Just to name a few, there is the Divita family, Pacific Coast Vaulters, Westwind Vaulters and Todd Griffith and his family in Canada. Finally, many people helped me through donating to my athlete’s page and other fundraising to assist financially. People followed me on Facebook and Instagram and sent me lovely messages of encouragement on my journey." Q. How did daily life change in the build up to WEG (if at all) and what were any challenges in your preparation? "A year and a half out from WEG I relocated to NSW. Straight away I began to study, work and train for six months. The year of WEG I had to defer from my course (Occupational Therapy), as I was overseas for two months out of both semesters. This meant I was working 4-5 times a week at the local café, as well as training every day. Two or three months out, I stopped working and was training with my coach Ali every day - two sessions daily, one in the morning and one at night. The four months throughout the year that I spent in the US I was also training daily." Q. Can you give me a run down on your WEG experience as a whole – what did you do in between what we saw back home, how did you find the overall experience and how has it changed you as a vaulter? "My WEG experience as a whole was incredible!! 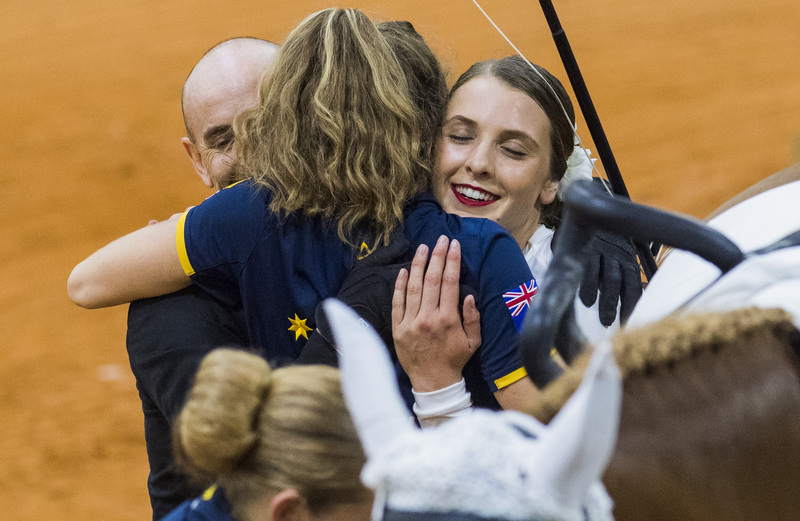 Being a member of an Australian vaulting team, that worked together and supported each other was wonderful. I was blessed to have an outstanding lunger, Todd Griffiths, who had also been my training partner in the month leading up to WEG - he too was competing at WEG, for the fourth time in the men’s division. We had a special bond come WEG, and Todd, Moon (the horse) and I were all in sync. I was super fortunate to vault On Lunar Eclipse (Moon), who was unshakable while we were competing and incredibly reliable. Moon’s owner Kim was also super supportive at the competition. She helped out in so many ways including: strapping, warming Moon up, lunging for both Todd and I, riding ...and the list goes on. Finally, I had an amazing groom, Shaina Hammond, who took care of all of Moon’s needs for us while at WEG. I feel very, very fortunate and grateful to have had such an awesome team around me at WEG. After competing at WEG it has made me even more determined as a vaulter to strive for my best and to aim that bit higher, so that someday I can be more competitive with the top 15." Q. Once home, did you take any time off or was it business as usual? How was your perspective on the world as a vaulter altered? "On returning home I had 3 days in Melbourne to relax and say thanks to my supporter base and was straight back into training, as I was competing at the Australian National Championships a week later. However, the past two and a half months since that competition, I have been taking a break. I went on a family holiday to Bali and have spent time with my family and friends. I then started back at work. The international standard and depth of vaulting is continuing to rise dramatically. For us Aussies to break into the Top 10 we need to continue to improve in all areas. I think what Jamie Hocking is doing by relocating to Europe and competing against the best on a regular basis is one way of doing that. The more we can work together and learn from the best, the better." Q. What are your aspirations going forward? "Coming into January 2019 I am ready to go and extremely motivated after my time off. I am excited to get back on the horse and start vaulting again, as well as getting back to the gym. I am also recommencing my university studies next month. Going forward, I aim to focus on completing my university degree over the next two years. I still have my sights set on WEG 2022 and will be assessing that as a goal after the next two years. In the meantime, I will be continuing to train hard and improve over the next two years, and will be attending local national competitions."